I found some great deals this month on books, clothes and meat. Check out the list below for all of the details. I kind of have a magazine obsession. I LOVE them, but hardly ever pay full price. I’m always on the lookout for used magazines and one of my favorite places to buy them is a local used bookstore. They have an awesome selection of popular magazines with current issues for .50 each! I scored a huge stack for the price of one new magazine. Awesome. One of the best ways to save money on kids clothes is to shop clearance racks for next season. The best time to do this is July/August and January/February because stores are getting rid of their current season clothes to make space for next season. I hit up a bunch of stores including Carter’s, Children’s Place and JCPenny and was able to find a ton of good deals because I stacked coupons with clearance prices. I try to find items for $2-$3 each and don’t like to go over $5 per new item. Click here for more tips on dressing your kids on a budget. One of the biggest ways I save on groceries is by shopping at Aldi. I try to get as much as I can there each week because they have the best prices without having to use coupons. Plus, they have good weekly deals on produce and meat. For example, they had chicken thighs on sale for .89 per pound so I stocked my freezer. I regularly get a weeks worth of groceries for $6o when I shop at Aldi. Click here for more ways to save on groceries. One of my favorite thrift stores had children’s books on sale for 75% off. I ended up paying around .20 per book so you can bet that we stocked up, which made my son very happy. Click here to learn how to get books for cheap or FREE. Like I said earlier, I stocked up on chicken thighs this month because they were on sale for .89 per pound. I also purchased some ground beef that was marked down because it was about to go past its freshness date. Click here to learn how to make your ground beef go further. 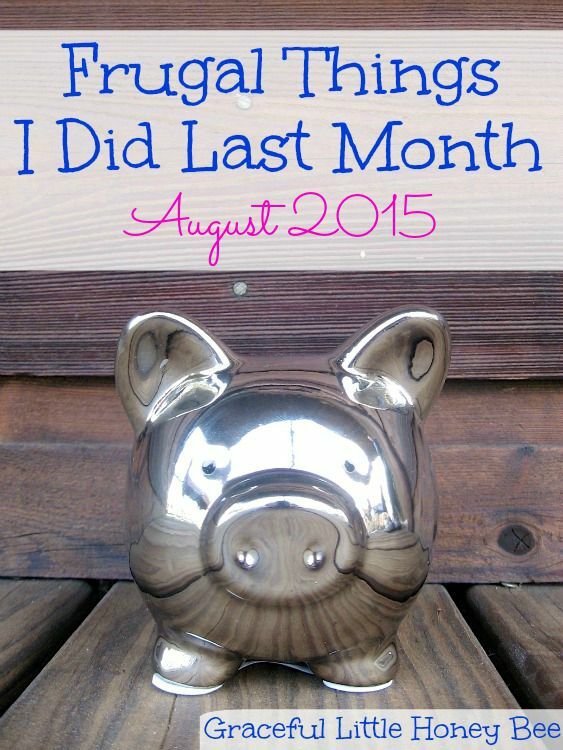 How did you save money this month? I’d love to know. I get a bunch of magazines for free (thanks to promotions that I find). I never thought of trying to see if a local bookstore would want them when I'm done with them. I always just end up tossing them! I love seeing the other ways that people save. It's always so inspiring! $0.89/lb. is a great price for chicken thighs too. I collected windfall apples which I stewed and froze. I picked plums and cherries growing wild locally. The cherries I have preserved in brandy and the plums I added to a Rumtopf. Both of these are for Christmas.